Work on climate-smart technologies that reduce methane emissions from rice was recognized at the Climate and Clean Air Coalition 2018 Awards during the Global Climate Summit on 11 September in San Francisco. The Climate and Clean Air Coalition (CCAC) conferred the Innovation in Behavioural Change award to the Northwest Focal Area Network (FAN) for its effort in reducing methane emissions in rice production. FAN—a network comprising hundreds of farmers, well owners, researchers, and extension agents that focuses on rice-based systems—was recognized for disseminating climate-smart technologies like the alternate wetting and drying (AWD) to rice farmers across 8 districts and 17 locations in Rangpur, northern Bangladesh. Over 5,000 farmers have already been reached by the network and a significant number has been testing and practicing the AWD technology, along with other mitigation measures. The FAN initiative took form through the Mitigation Options to Reduce Methane Emissions in Paddy Rice or Paddy Rice project currently implemented by the International Rice Research Institute in Bangladesh and Vietnam, and supported by CCAC and the CGIAR Research Program on Climate Change, Agriculture and Food Security (CCAFS). The Rangpur Dinajpur Rural Service (RDRS) oversees the program and activities of FAN as the network secretariat. “We are mobilizing the water users and suppliers, farmer groups, and extension people to use the AWD system across 2 million hectares of rice area to reduce methane emission by more than 50% and irrigation facilities by 30% in 17 locations in the northern areas. This aligns with our government’s mission and global commitment to reduce greenhouse gas emissions,” stated Mamunur Rashid, RDRS agriculture coordinator. The FAN illustrates an effective model of collective action towards mitigating climate change in rice-based systems in Bangladesh. The picture shows farmers and experts in one of the learning events organized by FAN. The CCAC Awards are given annually to individuals or groups for their exceptional contributions and actions to projects, policies, and practices that reduce short-lived climate pollutants (SLCPs) like black carbon, methane, hydrofluorocarbons, and tropospheric ozone. SLCP mitigation can cut global warming by 0.5oC and reduce crop losses by 50 million tons annually, according to a report of the World Meteorological Organization and the United Nations Environment Programme. Rice cultivation in flooded paddies contributes 10% of all agricultural greenhouse gas globally, particularly methane. It also takes up more than 3,000 liters of water to produce a kilo of rice. 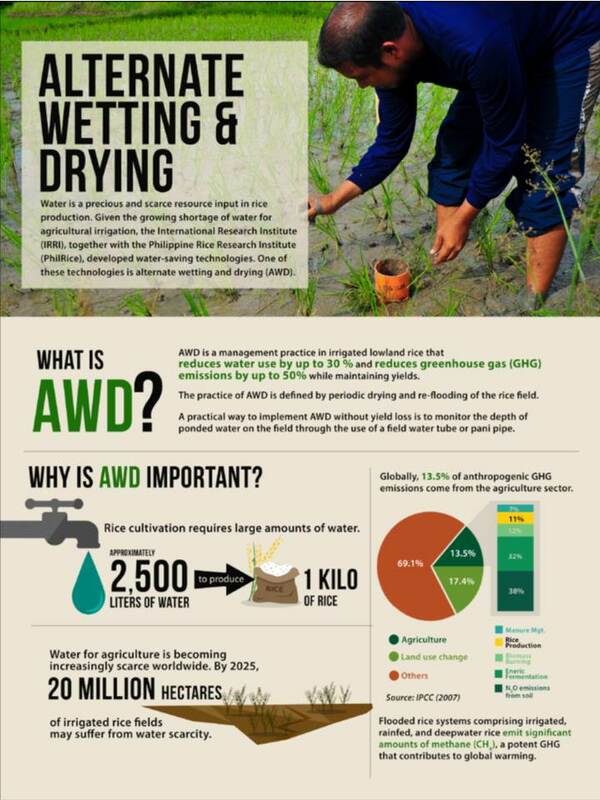 By using the AWD technology, rice farmers are able to reduce methane emissions by up to 50% and lessen irrigation water use by 30%. The farmers also observed a decrease in diesel consumption by 30 liters to power up irrigation pumps. 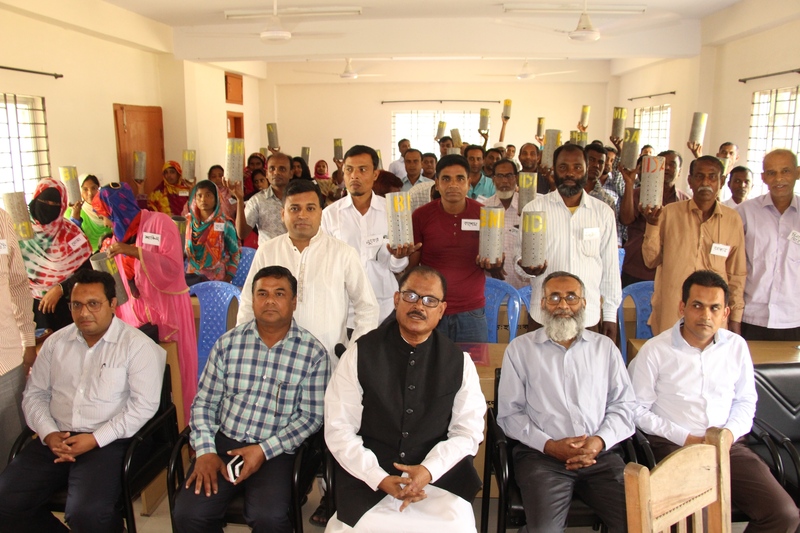 These offer immense benefits to low-income rice farmers in Rangpur by addressing the perennial problems of drought and scarce water supply in the area and providing additional income through cost-saving measures. Click here to read the rest of the article on Rice Today. Bernadette P. Joven is a Senior Communication Specialist at IRRI.